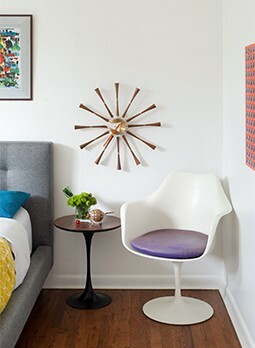 Midcentury sideboards and credenzas are staples of the style and provide good storage space. Look for maximum drawers to help you keep things out of sight. While you want to avoid a cluttered look, the surface area on top is another great place for storage. Use a Danish teak wood magazine rack to corral your papers, files or magazines. Use a teak wood roll-top box to store small office supplies. A vintage sewing box is another handsome and handy midcentury storage solution with lots of compartments that also looks great in your midcentury home! Modular storage with square cubes will be right at home with geometric, linear shapes and comes with the ability to keep things out of sight. If you’re successful paring things down, you could leave a few shelves empty to give it some breathing room. If you need significant space, consider this customizable and super-sized polychrome 54 wall unit. With generous storage space, you can also make it uniquely your own by choosing your colors for the frame and each sliding panel. Not only does it keep your stuff out of sight, it’s also a customized display. Made of bamboo and an aluminum frame, the materials are eco-friendly as well as compatible with midcentury style sensibilities, so you can live a clean life in every sense of the word.